The 2018 General Council recognition banquet was a success. 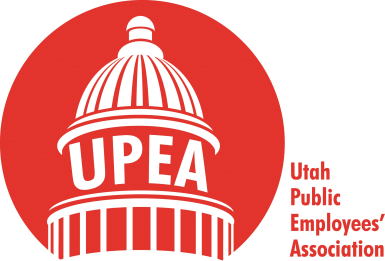 More than 150 delegates, honorees, and staff members celebrated the hard work devoted to the Utah Public Employees’ Association (UPEA) this year. Many honorees for the Public Employee Salute, the MACU/UPEA Scholarship, and the top district recruiters attended to accept their awards. UPEA’s outgoing president, Jeff Olinger, introduced the attendees at the head table, including Executive Director Todd Losser. Losser then introduced the UPEA staff members and thanked them for their work this year. Hannah Gorski and Camron Hill then introduced the Public Employee Salute winners and invited them to the stage to be recognized. If you’d like to read about the Public Employee Salute winners, please click here for the complete article. Kendle Zdunich then joined Camron Hill on the stage to congratulate the UPEA/Mountain America Scholarship winners and read about their academic accomplishments. To read more about the scholarship winners, please click here to read the complete article. Lastly, Olinger recognized the top recruiters from each district, and then announced the recruiter of the year, Erin Stephens. Stephens accepted her award and recruiter incentive. Olinger thanked Erin for her hard work recruiting this year and encouraged all members of UPEA to work hard to grow the Association. After the recognition banquet, delegates and honorees were encouraged to attend the president’s reception to welcome our incoming president, Mark Murray. On Friday, March 23, members gathered in the Sheraton Hotel’s Canyons Ballroom for a presentation by keynote speaker, Maj. Gen. Jeff Burton, adjutant general of the Utah National Guard. Burton has served as a company commander, battalion executive officer, and assistant professor of military science at both Brigham Young and Utah Valley universities. Burton spoke to delegates about earning opportunities. Burton spoke of a fellow soldier who lost both legs during combat. After his long recovery, this soldier opened a gym to help others who have lost limbs adapt to a new way of life. He said nobody has an excuse to quit or give up on their lives. When we wake up every morning, we are given an opportunity to be a neighbor, to help someone who may need it, or to help ourselves. Burton touched on many topics during his presentation, but there was one clear message: Regardless of trials, downturns, or hard times, make sure to live your life to the very best of your ability, because there are people in the world who will not have the opportunity. UPEA would like to thank Maj. Gen. Jeff Burton for spending the morning with us at General Council. He added that state employees are a huge reason that Utah is doing so well today. Herbert said that Utah is the fastest-growing state, as well as the most fiscally balanced. Utah wouldn’t be here today if it weren’t for the public employees. 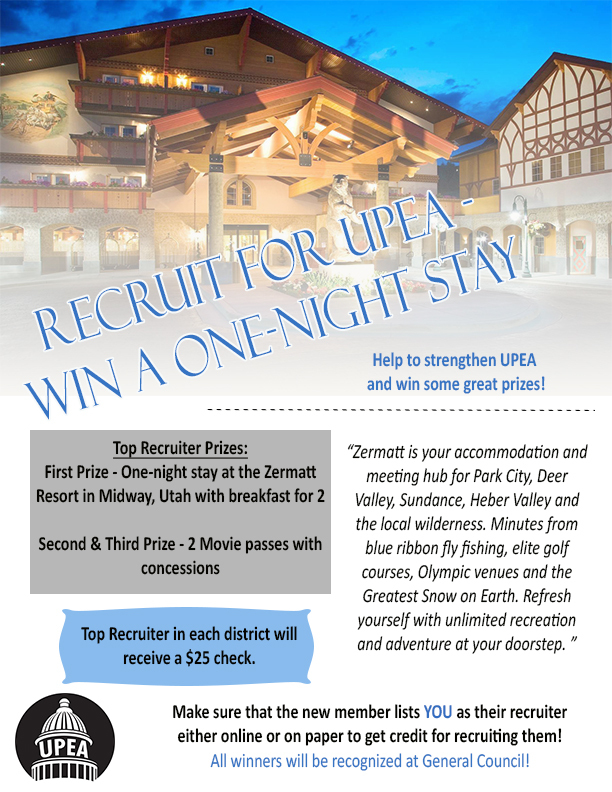 Herbert also thanked UPEA for its work in maintaining a great workforce for the state. He recognized that UPEA helps to make the necessary changes for state employees and appreciates the efforts made, especially during the legislative session. UPEA would like to thank the governor for taking time out of his busy schedule to speak with the delegates at General Council. UPEA delegates met to pass the UPEA Policy and Platform. UPEA’s attorney Lorin Barker from Kirton McConkie conducted the meeting as the parliamentarian. UPEA’s Policy and Platform defines the mission statement and general welfare of the association. Delegates meet annually at General Council to vote on any changes. Every district selects delegates to represent them and each delegate represents and votes on behalf of 40 UPEA members. Delegates updated parts of the UPEA Policy and Platform. They retained language regarding the Alternative State Application Program. They removed advocacy for a uniform merit law and the Medical School Salary Act for Higher Education because the Association no longer has a large higher education constituency. The delegates did not have any draft resolutions this year. Second Vice President Debra McBride provided an update regarding a task force’s study of UPEA’s current district structure and evaluation of any potential district alignment and restructuring. The task force believes UPEA’s current district structure is appropriate to fulfill the organization’s mission. UPEA members have the opportunity to get involved on the UPEA Resolutions Committee and recommend resolutions for discussion at the next General Council meeting. If you are interested in submitting a resolution to the Resolutions Committee, please contact Executive Director Todd Losser at 801-264-8732, ext. 204 or send an email to todd@upea.net. UPEA would like to thank everyone who attended General Council as a delegate, speaker, vendor, or honoree this year. The 2018 General Council was a success, and we appreciate everyone who helped make it great. If you have any questions about General Council, please call UPEA at 801-264-8732.